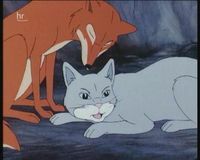 In Fox and Vixen’s earth, Vixen is attending to the cat’s injuries. He is recovering well and Kestrel tries to apologise. She and Fox go out hunting leaving Mole to look after the cat. When the cat pretends to be asleep, Mole pops home to eat some worms. The cat takes his chance and escapes back home. Badger is shocked to hear that Kestrel attacked his new friend. Starving, Fox and Vixen do not manage to catch anything to eat and when Mrs Vole dissapears, Fox is the prime suspect, until Weasel turns up. She saw Scarface eat Mrs Vole. The animals think Fox should deal with Scarface. Fox believes that fighting would only make matters worse. 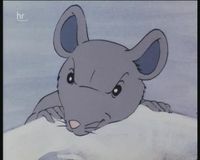 In that case, says Fieldmouse, the oath doesn't mean anything anymore! Later Scarface creeps up on Weasel and attacks her, biting her arm. He tells her that she has to spy on Fox, or he will kill her. Badger finally recovers from his injuries and the warden sends him back out into the park. 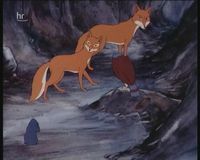 Arriving at Fox’s earth, where most of the animals have gathered, Badger tries to persuade the hungry animals that should all go and live in the warden’s cottage. The other animals laugh off this ridiculous suggestion, and Badger furiously leaves to return to the warden’s house by himself. However, when he tries to go back into the cottage, the warden pushes him back out. The cat explains to Badger that he is a wild animal and does not belong there. Badger sadly turns away and is met by Kestrel who has followed him. Spotting his chance for revenge while Kestrel is on the ground, the cat attacks her, but is fought off by Badger, who returns home to a warm welcome from his friends. In Fox’s earth, Badger comes up with a better idea to find food. 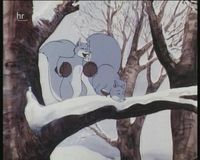 They can scavenge from humans, like they did on the way to the park.